A Voltage block is used in conjunction with mast a mounted preamplifier and a signal splitter when it's not convenient to have the signal splitter on the TV side of the preamplifier power injector. Mast mounted preamplifier's are comprised of two separate parts. The mast mounted portion where the amplification takes place and the indoor power injector that supplies the electricity for the operation of the mast mounted unit. To do this the power injector supplies low voltage electricity into the down lead coax cable that's coming down from the mast mounted preamplifier near the antenna. 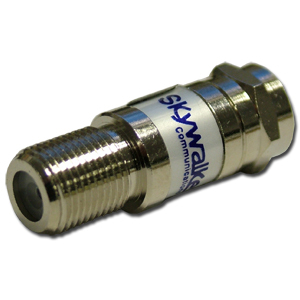 A signal splitter installed on the coax cable down lead between the indoor power injector and the mast mounted amplifier can interrupt the electricity and cause the preamplifier to malfunction. When to use a voltage block. When a signal splitter is located on the coax cable down lead between the indoor power injector and the mast mounted preamplifier. Many times a signal splitter is located in the attic or outside on the side of the home where an electrical outlet for the power injector is not available. Rather then rewire the entire system voltage blocks can be used at the signal splitter as shown below. When not to use a voltage block. When the coax cable down lead runs directly from the mast mounted preamplifier to the indoor power injector and the signal splitter is located on the TV side of the power injector. port and back out of the TV port to the TV at that location. 4 way signal splitter and voltage block configuration. 6 and 8 way signal splitters are configured in the same manner. Install a voltage block on each output port that does not lead to the power injector. A 6 way splitter will need 5 voltage blocks and an 8 way will need 7.